The lance is probably the oldest cavalry weapon. It allows the user to put all his weight, and that of his charging horse, behind one very sharp point. In the hands of a skilled man that point can be driven right through a man. This makes lances intimidating to face but, if a lancer does not kill his target, he is vulnerable: a lance is less use than a sword in a melee, so the lancer is at a disadvantage. This is also true against well-trained infantry capable of forming square. Historically, many nations used lancers. 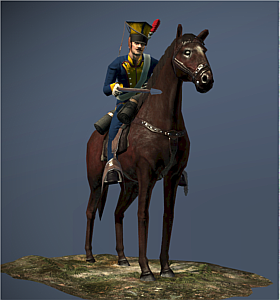 Napoleon even recruited Polish lancers to be part of his Imperial Guard. Surprisingly, each type of cavalry regiment required its own set of horse furniture, especially designed for the tactics that would be used. Lancer saddles tended to be made of beech wood, covered in black leather and reinforced with metal bands. They differed from the more elaborate dragoon saddle that required holsters for pistols, and a heavy sheepskin to protect the weapons and the lower body of the rider.